This is the Mission as it appears today. I am a real fan of tourism, taking time while traveling to make an effort to see the spots that locals think are worth experiencing. So let's pretend you are visiting me, and I want to show you my very favorite places so you leave with a great memory of Santa Barbara. No shopping at a mall, OR eating at a chain restaurant! I am going to list here my top places that I feel will give you a sense for the history and character of the fabulous world-class resort I call home. Sure, it has a corny architectural theme park look, and we like it that way! It is a land of climate, not weather, and you can pretty much count on a 70 degree mild bright day all year long. (Except for the June Gloom, when a maritime fog hovers much of the day.) It is this unique micro-climate, caused by the Channel Islands visible on the sea horizon, that makes it possible to grow amazing subtropical plants in this tiny coastal zone. This is the Mission as it appeared in 1870, when it was the center of life in the region. Let's begin the tour with the Santa Barbara Mission. Known as "The Queen of the MIssions" this fine bit of religious architecture was first erected in 1786. It is the tenth in the chain of missions that string one day's travel apart all the way up California, and gave the Spaniards their bases from which to establish their control over the Western Coast. This is just about the oldest building you'll be able to visit in the area, and if you are here on a Sunday you can attend mass. While you are in Mission Canyon the next place to visit is the Santa Barbara Museum of Natural History, just above the Mission. Founded in 1916, it is a wonderful resource to learn about the local Chumash Indians and their customs, and explore taxidermy halls with local birds, animals, insects and fish. My very favorite thing at the museum is the Blue Whale skeleton. You can stand inside it and pose as Jonah. If you continue up to the top of the canyon there is a lovely place for a stroll at the base of the mountains, the Santa Barbara Botanic Garden. Over 1,000 species of rare and indigenous plants grow on 78 acres, many labeled for study, and at any time of year there are beautiful displays of native flowers in bloom and paths to hike along the creek and discover waterfalls. The views up into the Santa Ynez Mountains and out to the channel are superb, and it is a sanctuary in which to contemplate nature. 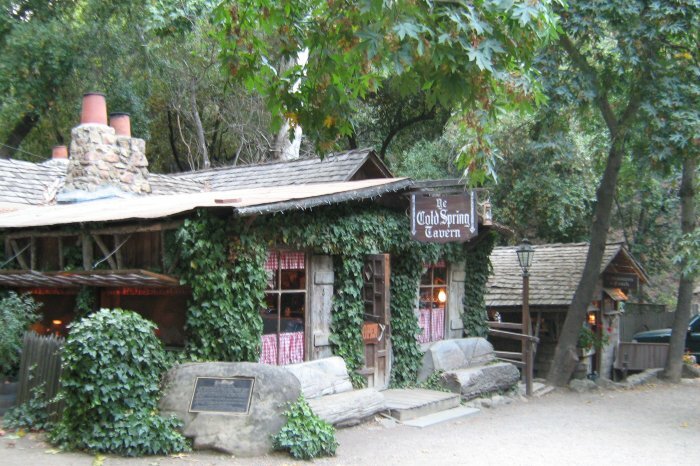 Now that all this exploring and walking around has worked up a thirst, the next stop is the Cold Spring Tavern up at the top of Hwy 154, the San Marcos Pass. Established in 1865, it is a real stage coach stop, where passengers would take a moment for a fortifying drink before descending or after ascending the huge hill. The food is superb, the atmosphere authentic, and you will feel like you have gone back to cowboy times. On the weekends there is often live entertainment and a colorful crowd. You may think this was enough for one day, but before you head back down the hill take just one short detour. In a steep mountainside canyon off Hwy 154 is a small sandstone cave formation that has been designated the Chumash Painted Cave State Historic Park. 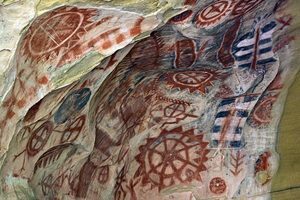 It contains what is considered to be some of the finest rock art in America, created hundreds of years ago by the Chumash Native Americans. It is a steep climb to the iron grill over the cave entrance that protects the paintings, and be prepared to use a flashlight to be able to see them at any time of day. Enough for one day, you say? I should think so. 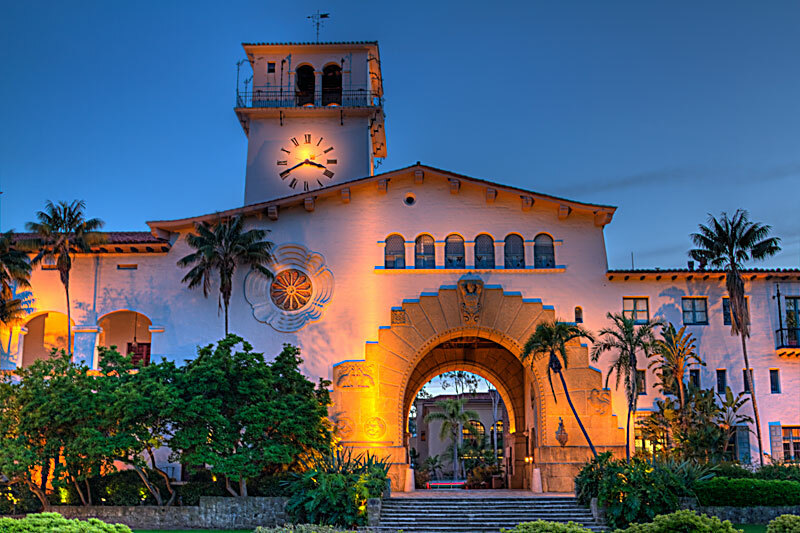 Start your exploration of downtown Santa Barbara with an elevator ride up to the top of the Courthouse clock tower. From that elevated perspective you can look down on the entire town, and plan your route for your tour. Another way to explore the area is aboard the amphibious Land Shark, which will take you for a spin around town and then out to sea as well. For such a well-known city it really is remarkably small. The entire downtown is 20 blocks, and the tattoo studio is at the very top of the urban corridor. If you opt to walk around downtown there are many strange and curious things to see. For instance, there is a Moreton Bay fig tree that was transplanted to its present location in 1877. It is more than 80 feet high and its canopy spreads more than 175 feet across. 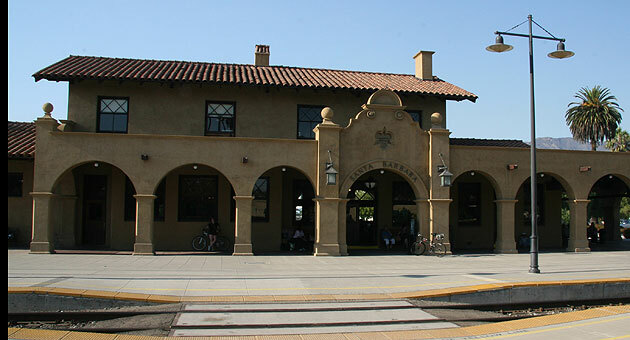 Directly adjacent the Big Fig is the Train Station, built in 1902 in the Spanish Mission Revival style..
A closeup view of the roots, truly massive. A short walk from the Big Fig and the train depot across the waterfront will bring you to the harbor, and the best seafood in town. For lunch or dinner I recommend you go down to Brophy Brothers Restaurant, located inside the harbor. Only a tourist would eat on the wharf (pier), real locals go to the harbor itself; and if you have to wait to get a table at Brophy's (you will) you can go for a walk out on the breakwater and work up an appetite for local fish while looking at yachts. Ask for a table on the balcony so you can watch our local fishermen unloading their catches on the adjacent dock. And don't miss the Great Blue Heron standing proudly on the roof; it is a decoy I put there as a gift to the owners, to fool tourists! I bet a million people have taken its picture before they realize it isn't moving!!! See that blue heron on the roof? It is a decoy I gave them! And if your are in the harbor, perhaps you will feel inspired to go to sea. An excellent opportunity awaits with the two charter services that run whale watching trips out to the Channel Islands National Marine Sanctuary. The Condor Express runs an efficient and highly professional operation that will take you out to see the islands up close and search to find whales and dolphins to let you observe them in their natural environment. 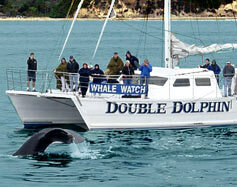 The Double Dolphin is a catamaran that can glide up for extremely close encounters with marine life in the channel. The Santa Barbara Channel and Channel Islands are considered premier whale watching areas, a rare opportunity. But I admit it I'm not much of a boat enthusiast. I'd rather walk by the ocean than float about on it. 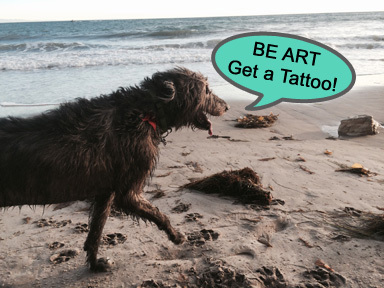 If you are traveling here with a dog, Fergus the Irish Wolfhound says Hendry's Beach is the best! Formally known as Arroyo Burro Beach it is the go-to spot for all local and visiting canines. Their humans go for the surf and the best sunsets. If you are visiting with children, only 5 blocks from my studio at 1400 Santa Barbara Street x Micheltorena is a wonderful FREE city park that is a community treasure. It was built by locals, and has lots of climbing structures and swings and ramps.... PLEASE don't take your kids shopping while your significant other gets their tattoo, wear the kids out and let them play! If your kids like animals I can highly recommend the Santa Barbara Zoo. I worked there while attending UCSB and helped to landscape many of the exhibits. It is a very well maintained with a fine variety of animals. I might even tell you about that elephant shown above throwing me in the moat! ALL ANIMALS WELCOME at LUCKYFISH !!! ! Of course I am a Mule Enthusiast, so my last suggestion is that you get in touch with your inner CowPerson and go for a trail ride in the mountains. The wranglers at Rancho Oso have a string of seasoned horses, and walking out of the stables you are immediately in the chaparral. There are many trails that go through forested areas, along the Santa Ynez River, and up into the surrounding Los Padres National Forest. The facility is half an hour from downtown, and you will feel transported into another time, when California had yet to be civilized. 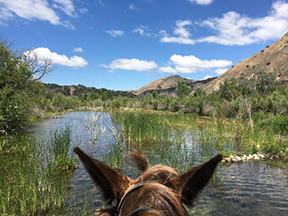 This is a photo taken from the back of Tobe Mule walking across the Santa Ynez River on the edge of Rancho Oso. Postcard perfect. they don't have any mules for rent! I do hope that these suggestions will give you some ways to enhance your trip to Santa Barbara. I will do my best to make sure you leave with a high quality permanent souvenir of your visit.